Mesothelioma is a malignant neoplasm originating from pleural or peritoneal surfaces; this condition is usually associated with occupational exposure to asbestos. Wagner et al connected asbestos to mesothelioma in a classic 1960 study of 33 patients with mesothelioma who were exposed to asbestos in a mining area in South Africa's North Western Cape Province. Of the 33 patients, 32 had been exposed to crocidolite, the most carcinogenic type of asbestos. Asbestos mining and production peaked from the 1930s-1960s, and asbestos was used in a variety of products ranging from construction supplies to brake linings. During World War II, hundreds of thousands of civilian and military workers, through their occupations, were exposed to asbestos. Production slowed dramatically in the 1970s as the health risks of asbestos became known. Governmental restrictions were placed on its use, and alternative materials became available. Despite these changes, asbestos continues to be used in the manufacture of some fire safety products. The clinical latency period between asbestos exposure and mesothelioma development is 35-40 years, and as a result, the number of mesothelioma patients has continued to rise despite decreased asbestos production. The most common findings on physical examination (79%) are signs of pleural effusion (eg, dullness to percussion, decreased breath sounds). The diagnosis of mesothelioma should be made with care. A clinical history of asbestos exposure and radiologic findings that are consistent with mesothelioma warrant inclusion of mesothelioma in the differential diagnosis, but it is important to stress that a diagnosis of mesothelioma cannot be made exclusively with imaging studies. More common diseases, such as benign asbestos-related pleural disease and metastatic adenocarcinoma, can look radiographically identical to mesothelioma. Biopsy with special staining and immunohistochemical and ultrastructural analysis are absolutely essential for the accurate diagnosis of mesothelioma. 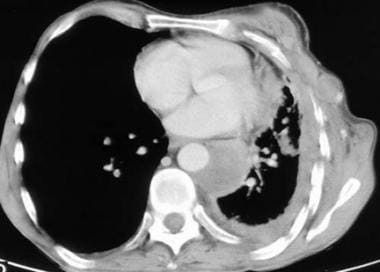 Chest radiography is the initial screening examination, while computed tomography (CT) scanning is preferred for staging the tumor. Chest radiography has limited usefulness. The radiographic findings of mesothelioma are nonspecific and are observed in other diseases, including metastatic carcinoma, lymphoma, and benign asbestos disease. 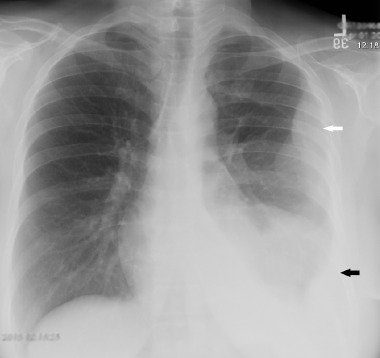 Small malignant pleural effusions may not be observed on standard radiographs. Alternatively, large pleural effusions can obscure pleural thickening or masses; therefore, disease extent is frequently underestimated in radiographs. Neither CT scanning nor MRI provides an unequivocal diagnosis of mesothelioma; tissue biopsy is required for the definitive diagnosis. The most common mesothelioma finding on radiographs is unilateral, concentric, plaquelike, or nodular pleural thickening (as seen in the images below). Pleural effusions are common and may obscure the presence of the underlying pleural thickening. The tumor frequently extends into the fissures, which become thickened and irregular in contour. A slight right-sided predominance is observed, possibly because of a larger pleural surface area. The tumor can rigidly encase the lung, causing compression of lung parenchyma, diaphragm elevation, intercostal space narrowing, and mediastinal shift toward the tumor. Calcified pleural plaques are present in 20% of patients with mesothelioma and are usually related to the previous asbestos exposure. Lung nodules and hilar masses usually result from direct mesothelioma tumor extension into the lung parenchyma and mediastinal structures, such as lymph nodes, the pericardium, and the heart. Mechanical distortion of the hemithorax, chest wall masses, periosteal rib reaction or rib destruction by the tumor are signs of advanced disease. Although usually unilateral, direct extension of the tumor across the mediastinum into the contralateral hemithorax does occur. 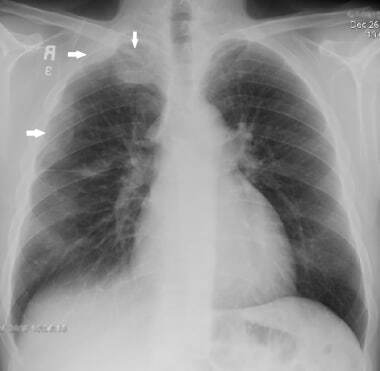 Chest radiograph (CXR) of a 50-year-old male who presented with chronic dry cough of a few months' duration. 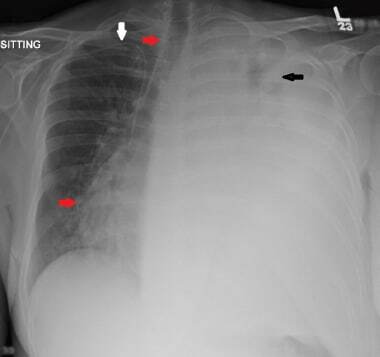 The radiograph shows lobulated pleural-based masses in the right hemithorax peripherally (white arrows). Pleural biopsy confirmed malignant mesothelioma. No pleural effusion is present. This 63-year-old woman presented with chest pain. Chest radiograph demonstrates lobulated left pleural-based mass (white arrow) along with a small pleural effusion (black arrow). The lobulated mass was confirmed to be malignant mesothelioma on biopsy. This 57-year-old man presented with shortness of breath. 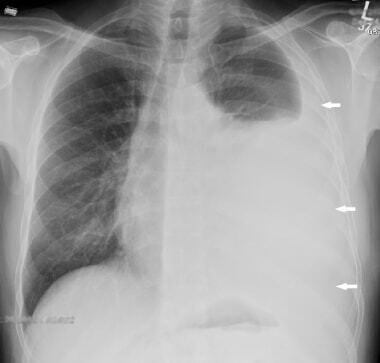 Chest radiograph showed a moderate-sized left pleural effusion (white arrows). Cytology indicated malignant mesothelioma. This chest radiograph is of a 47-year-old male patient with known malignant mesothelioma not responding to treatment. There is a large left pleural effusion with very little remaining aeration in the left upper lung (black arrow). There is contralateral tracheal and mediastinal shift (red arrows). A right subclavian central venous access line is in-situ (white arrow). Although a definite diagnosis cannot be made on the basis of plain film findings, new unilateral pleural thickening or effusion in a patient who has a history of exposure to asbestos is highly suggestive of mesothelioma. 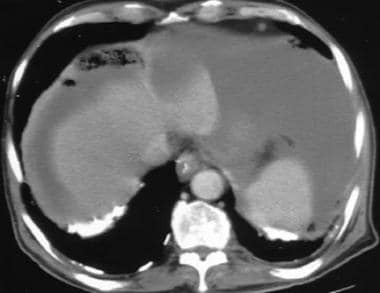 False-positive diagnosis based on imaging alone could be due to pleural metastases from adenocarcinoma, breast or other primary malignancies, involvement of the pleura by lymphoma or thymoma, or chronic infection. False-negative findings are possible with minimal small focus of pleural involvement by mesothelioma. CT scan findings (examples of which are shown in the images below) are similar to those of plain films but are seen better and in more detail. [12, 13] Furthermore, pleural thickening and effusion can be distinguished with CT scanning. Nodular pleural thickening, pleural thickening greater than 1 cm, involvement of the mediastinal pleural surface, and concentric pleural thickening are all highly suggestive of malignant pleural disease, either mesothelioma or metastases. The tumor extent along the pleural surfaces and into the mediastinum, diaphragm, or chest wall can be evaluated much better with CT scanning than with plain radiography. Chest wall invasion manifests as obliteration of fat planes or chest wall nodules. 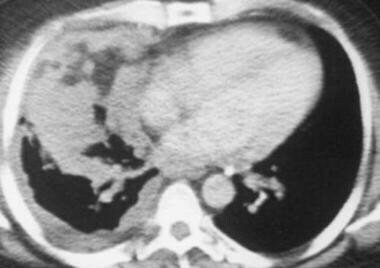 Diaphragmatic invasion, ascites, and omental caking are common CT scan findings of peritoneal mesothelioma. 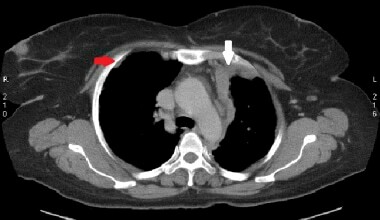 Computed tomography scan of a 58-year-old patient with mesothelioma and shortness of breath. 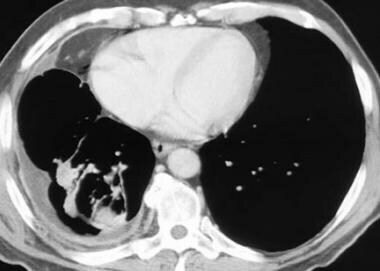 This image shows the extensive pleural thickening that is characteristic of mesothelioma, effusion, and reduction in the volume of the affected hemithorax. 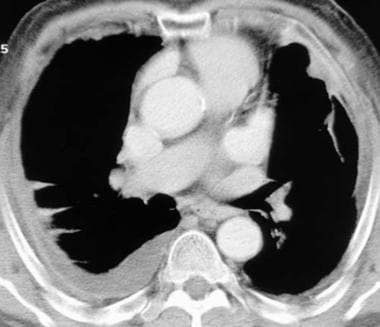 Computed tomography scan of the chest. This image demonstrates mesothelioma that extends into the chest wall. 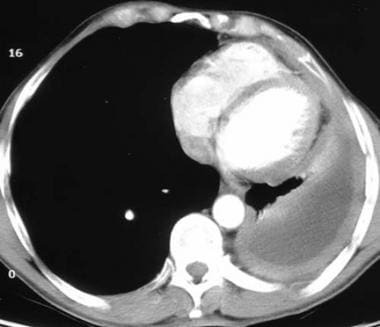 Note the concentric left pleural thickening, pleural effusion, reduction in volume of the left hemithorax, and the tumor nodules within the chest wall. Computed tomography scan in a 48-year-old man with right-sided chest pain and a "tight sensation," who worked as a welder in a Norfolk, Virginia, shipyard. This image shows that the thick inhomogeneous pleural rind encases the lung (causing volume loss) and extends into the major fissure. Computed tomography scan in a 70-year-old man with chronic cough, hoarseness, and a 20-lb weight loss over 3-4 months. This image demonstrates the left lung is surrounded by a thickened pleura. 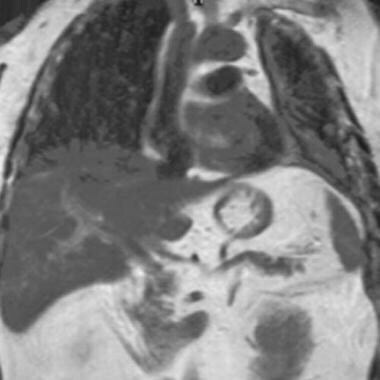 Computed tomography scan in a 71-year-old man with increasing dyspnea and a history of asbestos exposure several decades earlier. This image shows that the right lung is reduced in volume as a result of the encasing pleural rind. An associated pleural effusion and right lower-lobe rounded atelectasis are also seen. Computed tomography (CT) scan in a male Veterans Administration patient with a history of asbestos exposure and an enlarging abdominal girth. This upper CT scan slice reveals the calcified pleural plaques along the diaphragmatic surface that are associated with asbestos exposure. Ascites is seen lateral to the liver. Aspiration of the ascitic fluid demonstrated mesothelioma. Computed tomography (CT) scan in a male Veterans Administration patient. This lower CT scan slice demonstrates ascites, omental caking, and mesenteric thickening. Computed tomography scan in a 68-year-old man with known asbestos exposure. Multiple biopsies were negative for mesothelioma, and the chest findings were attributed to benign, asbestos-related pleural disease, which is a diagnosis of exclusion. Axial slice from staging chest CT scan and biopsy in a 52-year-old woman confirmed malignant mesothelioma. There is lobulated irregular mediastinal and anterior parietal pleural thickening (white arrow). A non-calcified pleural plaque is visible on the right (red arrow). Axial slice from staging CT scan of a 67-year-old male construction worker. 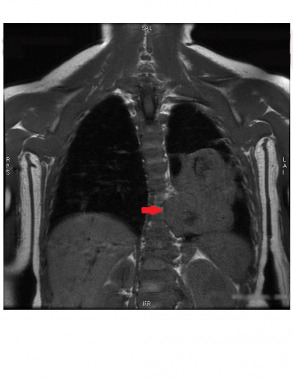 There is irregular pleural thickening due to malignant mesothelioma (black arrow). There is also a trace of pleural effusion (yellow arrow). A calcified pleural plaque can be seen, which is a hallmark of previous asbestos exposure (red arrow). Approximately 80% of malignant mesotheliomas occur in individuals who have been exposed to asbestos. 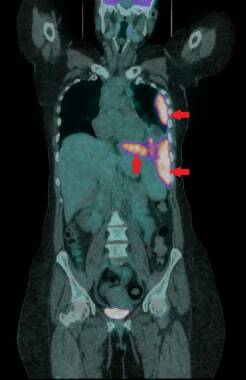 A case of early right pleural malignant mesothelioma (red arrow). 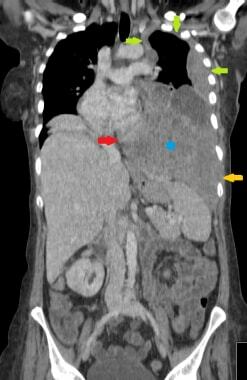 The CT scan was acquired without administering intravenous contrast due to renal impairment. 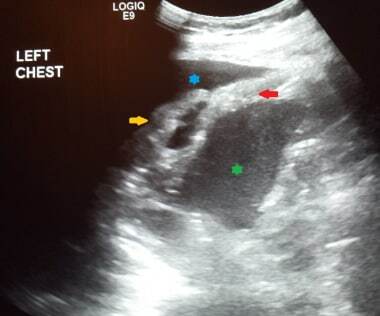 There is also a small ipsilateral pleural effusion (yellow arrow). 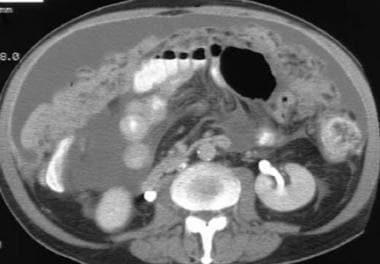 This 58-year-old patient presented with abdominal fullness. 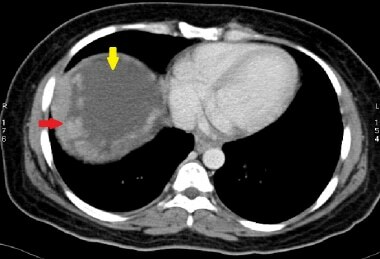 Axial slice from a CT scan shows irregular peritoneal thickening (red arrow), confirmed to be epithelioid malignant mesothelioma. There is also free fluid below the diaphragm (yellow arrow). Another case of malignant peritoneal mesothelioma in a 51-year-old man. 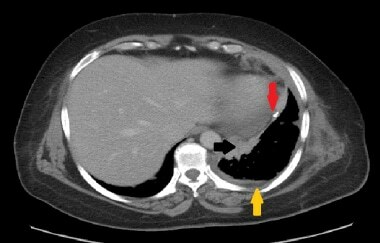 There are irregular, enhancing peritoneal masses in the right upper abdomen (yellow arrows) with significant ascites. There is also omental caking (red arrow). 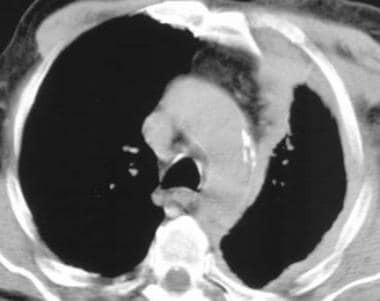 Coronal reformat from staging CT scan of a 70-year-old female patient with advanced left pleural malignant mesothelioma. There is a large heterogeneously enhancing mass occupying the lower left hemithorax (blue asterisk). There is complete encasement of the left hemithorax (green arrows). 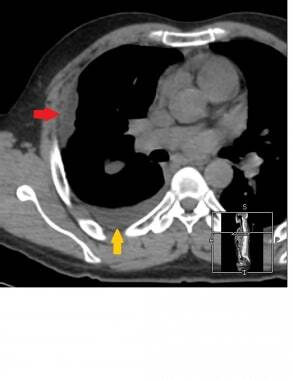 There is invasion of the mediastinum (red arrow) as well as early invasion into the lateral chest wall (yellow arrow). Benign pleural plaques or pleural thickening from asbestos exposure may mimic the appearance of nodular pleural thickening in patients with mesothelioma (see the image below). This T1-weighted coronal image shows malignant mesothelioma, which is isointense to the muscles. 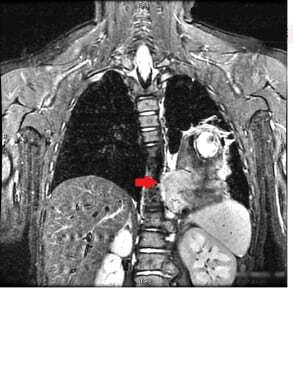 MRI has superior soft tissue resolution, with clear evidence of mediastinal invasion on this image (red arrow). This coronal T2-weighted STIR image demonstrates malignant mesothelioma to have slightly higher intensity than muscles (red arrow). These tumors can also be isointense to the muscles on T2-weighted sequences. This gradient echo sagittal MRI image clearly shows evidence of malignant mesothelioma invasion into the chest wall (red arrows). MRI has superb soft tissue resolution and hence can help in cases where chest wall invasion is not clear on another imaging modalities. Magnetic resonance imaging (MRI) scan in a 72-year-old Veterans Administration patient with left-sided mesothelioma. Note that the MRI scan well delineates the soft tissues and, in particular, the thoracoabdominal interface at the diaphragm. This ultrasound image of the right lower chest demonstrates biopsy proven malignant pleural mesothelioma (red arrow). There is a small to moderate pleural effusion (blue asterisk). 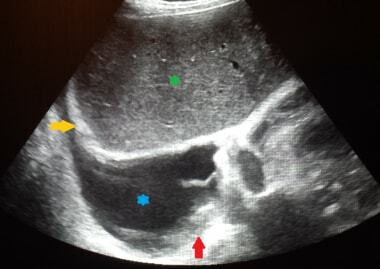 Echogenic right hemidiaphragm (yellow arrow) and liver (green asterisk) are also visualised. Left chest ultrasound in this patient demonstrated localized pleural thickening, subsequently confirmed as malignant mesothelioma (red arrow). The patient had presented with shortness of breath and easy fatigability. Collapsed left lower pulmonary lobe can be seen (yellow arrow) within pleural effusion (blue asterisk). Spleen is also visualized (green asterisk). If surgical resection of the tumor is a possibility, a quantitative ventilation-perfusion scan helps in assessing the function of the contralateral lung. 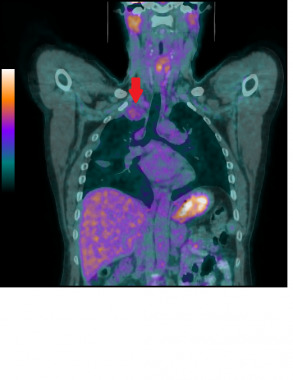 This coronal 18F-FDG PET/CT demonstrates a markedly FDG avid (SUVmax 11.2) biopsy-proven malignant mesothelioma (red arrows). Physiologic tracer activity is also visible in the brain and urinary bladder. Malignant mesotheliomas are not always very FDG avid. In this case, only background-level FDG avidity (SUVmax 2.1) was demonstrated by the right apical malignant mesothelioma (red arrow). 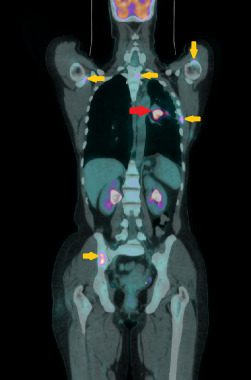 18F-FDG PET/CT demonstrates moderate FDG avidity (SUVmax 7.8) recurrence of malignant mesothelioma in the left lung (red arrow), along with scattered bone metastases (yellow arrows). A relatively new and exciting application of 18F-FDG PET/CT is post-therapy response evaluation. 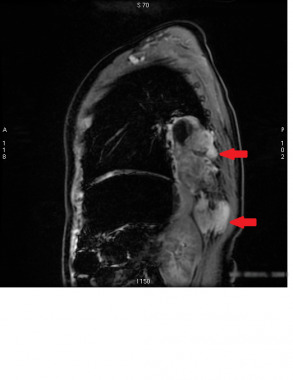 Here is a case of malignant mesothelioma before (A) and after (B) systemic treatment. There is a partial response to treatment evidenced by the reduction in bulk and FDG avidity of the disease (red arrows). The SUVmax pre-treatment was 8.1, while that after treatment was 2.2. There is also interval reduction in pleural thickening and effusion (yellow arrows). Pleural inflammation can also reveal increased uptake on PET scanning. Wagner JC, Sleggs CA, Marchand P. Diffuse pleural mesothelioma and asbestos exposure in the North Western Cape Province. Br J Ind Med. 1960 Oct. 17:260-71. [Medline]. Ceresoli GL, Gridelli C, Santoro A. Multidisciplinary treatment of malignant pleural mesothelioma. Oncologist. 2007 Jul. 12(7):850-63. [Medline]. [Full Text]. Wilcox BE, Subramaniam RM, Peller PJ, Aughenbaugh GL, Nichols Iii FC, Aubry MC, et al. 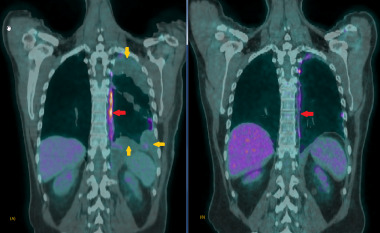 Utility of integrated computed tomography-positron emission tomography for selection of operable malignant pleural mesothelioma. Clin Lung Cancer. 2009 Jul. 10(4):244-8. [Medline]. Truong MT, Viswanathan C, Godoy MB, Carter BW, Marom EM. Malignant pleural mesothelioma: role of CT, MRI, and PET/CT in staging evaluation and treatment considerations. Semin Roentgenol. 2013 Oct. 48(4):323-34. [Medline]. Armato SG 3rd, Labby ZE, Coolen J, Klabatsa A, Feigen M, Persigehl T, et al. Imaging in pleural mesothelioma: A review of the 11th International Conference of the International Mesothelioma Interest Group. Lung Cancer. 2013 Nov. 82(2):190-6. [Medline]. Gill RR, Gerbaudo VH, Sugarbaker DJ, Hatabu H. Current trends in radiologic management of malignant pleural mesothelioma. Semin Thorac Cardiovasc Surg. 2009 Summer. 21(2):111-20. [Medline]. Roca E, Laroumagne S, Vandemoortele T, Berdah S, Dutau H, Maldonado F, et al. 18F-fluoro-2-deoxy-d-glucose positron emission tomography/computed tomography fused imaging in malignant mesothelioma patients: looking from outside is not enough. Lung Cancer. 2013 Feb. 79(2):187-90. [Medline]. Appenzeller P, Mader C, Huellner MW, Schmidt D, Schmid D, Boss A, et al. PET/CT versus body coil PET/MRI: how low can you go?. Insights Imaging. 2013 Aug. 4(4):481-90. [Medline]. [Full Text]. Klabatsa A, Chicklore S, Barrington SF, Goh V, Lang-Lazdunski L, Cook GJ. The association of 18F-FDG PET/CT parameters with survival in malignant pleural mesothelioma. Eur J Nucl Med Mol Imaging. 2013 Sep 21. [Medline]. Niccoli-Asabella A, Notaristefano A, Rubini D, Altini C, Ferrari C, Merenda N, et al. 18F-FDG PET/CT in suspected recurrences of epithelial malignant pleural mesothelioma in asbestos-fibers-exposed patients (comparison to standard diagnostic follow-up). Clin Imaging. 2013 Nov-Dec. 37(6):1098-103. [Medline]. Heelan RT, Rusch VW, Begg CB, et al. Staging of malignant pleural mesothelioma: comparison of CT and MR imaging. AJR Am J Roentgenol. 1999 Apr. 172(4):1039-47. [Medline]. [Full Text]. Chaisaowong K, Aach T, Jäger P, et al. Computer-assisted diagnosis for early stage pleural mesothelioma: towards automated detection and quantitative assessment of pleural thickening from thoracic CT images. Methods Inf Med. 2007. 46(3):324-31. [Medline]. Patz EF Jr, Shaffer K, Piwnica-Worms DR, et al. Malignant pleural mesothelioma: value of CT and MR imaging in predicting resectability. AJR Am J Roentgenol. 1992 Nov. 159(5):961-6. [Medline]. [Full Text]. Giesel FL, Bischoff H, von Tengg-Kobligk H, et al. Dynamic contrast-enhanced MRI of malignant pleural mesothelioma: a feasibility study of noninvasive assessment, therapeutic follow-up, and possible predictor of improved outcome. Chest. 2006 Jun. 129(6):1570-6. [Medline]. [Full Text]. Nickell LT Jr, Lichtenberger JP 3rd, Khorashadi L, Abbott GF, Carter BW. Multimodality imaging for characterization, classification, and staging of malignant pleural mesothelioma. Radiographics. 2014 Oct. 34(6):1692-706. [Medline]. Ghigna MR, Crutu A, Florea V, Soummer-Feulliet S, Baldeyrou P. The role of endobronchial ultrasound-guided fine needle aspiration in the diagnosis of pleural mesothelioma. Cytopathology. 2015 Aug 27. [Epub ahead of print]:[Medline]. Sperandeo M, Dimitri L, Pirri C, Trovato FM, Catalano D, Trovato GM. Advantages of thoracic ultrasound-guided fine-needle aspiration biopsy in lung cancer and mesothelioma. Chest. 2014 Nov. 146(5):178-9. [Medline]. Lococo F, Rossi G, Agostini L, Filice A, Paci M, Rapicetta C, et al. "Dry" pleural mesothelioma successfully diagnosed on endobronchial ultrasound (EBUS)-guided transbronchial needle aspiration (TBNA). Intern Med. 2014. 53(5):467-9. [Medline]. Yildirim H, Metintas M, Entok E, Ak G, Ak I, Dundar E, et al. Clinical Value of Fluorodeoxyglucose-Positron Emission Tomography/Computed Tomography in Differentiation of Malignant Mesothelioma from Asbestos-Related Benign Pleural Disease: An Observational Pilot Study. J Thorac Oncol. 2009 Oct 28. [Medline]. Mavi A, Basu S, Cermik TF, Urhan M, Bathaii M, Thiruvenkatasamy D, et al. Potential of dual time point FDG-PET imaging in differentiating malignant from benign pleural disease. Mol Imaging Biol. 2009 Sep-Oct. 11(5):369-78. [Medline]. Yamamoto Y, Kameyama R, Togami T, Kimura N, Ishikawa S, Yamamoto Y, et al. Dual time point FDG PET for evaluation of malignant pleural mesothelioma. Nucl Med Commun. 2009 Jan. 30(1):25-9. [Medline]. Flores RM, Akhurst T, Gonen M, et al. Positron emission tomography predicts survival in malignant pleural mesothelioma. J Thorac Cardiovasc Surg. 2006 Oct. 132(4):763-8. [Medline]. Marin-Oyaga VA, Salavati A, Houshmand S, Pasha AK, Gharavi M, Saboury B, et al. Feasibility and performance of an adaptive contrast-oriented FDG PET/CT quantification technique for global disease assessment of malignant pleural mesothelioma and a brief review of the literature. Hell J Nucl Med. 2015 Jan-Apr. 18(1):11-18. 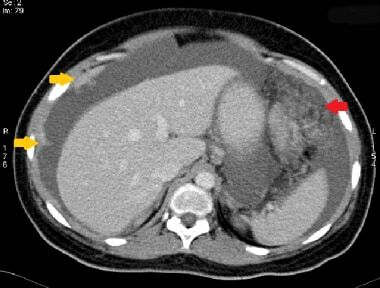 Nakajima R, Abe K, Sakai S. Diagnostic Ability of FDG-PET/CT in the Detection of Malignant Pleural Effusion. Medicine (Baltimore). 2015 Jul. 94 (29):e1010. [Medline]. Lopci E, Zucali PA, Ceresoli GL, Perrino M, Giordano L, Gianoncelli L, et al. Quantitative analyses at baseline and interim PET evaluation for response assessment and outcome definition in patients with malignant pleural mesothelioma. Eur J Nucl Med Mol Imaging. 2015 Apr. 42(5):667-75. [Medline]. Chest radiograph of a 65-year-old man with left-sided chest pain and biopsy-proven mesothelioma. The left lateral pleura is thickened and lobulated, which is often observed with mesothelioma. Chest radiograph of a 58-year-old patient with mesothelioma and shortness of breath. This image reveals diffuse, left-sided pleural thickening, a pleural effusion, and ipsilateral volume loss. Chest radiograph of 65-year-old woman with a history of mastectomy for breast cancer who had recurrent pleural and parenchymal metastases. This lateral chest radiograph demonstrates thickening of the major fissure and blunting of the posterior costophrenic angle. This appearance is indistinguishable from that of mesothelioma.